This year featuring a NASA scientist and the Nationals’ team mascot, the SMASH Contest uniquely combines science, sports and art to incite a desire to learn. 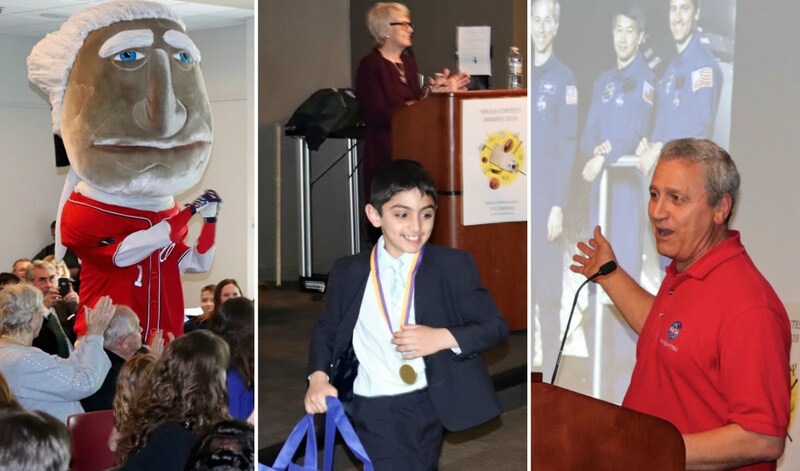 Local students were recognized at the 5th annual SMASH Contest in Arlington, Va. L-R: Nationals baseball team mascot “George Washington” greets families; 2nd grader Suren Sarafian accepts his award; NASA scientist Dr. Larry DeLucas shares about flying on Space Shuttle Columbia. Last Wednesday, a group of 100 students, parents and community leaders attended an awards ceremony in Arlington, Virginia. The annual SMASH Art Contest recognized 26 winners from a dozen schools in northern Virginia. Elementary and middle school students created artwork showing how their favorite sports are linked to math and science concepts. 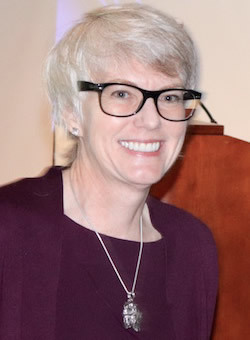 Now in its fifth year, SMASH stands for Sports, Math, And Scientific Hypothesis explains executive director Brig Pari. Brig Pari, executive director of SMASH. Costumed mascot “George” of the Washington Nationals baseball team made an appearance, to kids’ cheers and parents’ photos. Awardees received two tickets to a Nationals game, in addition to rewards from Think Fun and Arlington Planetarium. “An art contest is the perfect medium,” says Pari. “It’s unrealistic to think a kindergartener is going to write an essay about Newton’s first law. But it’s easy to understand that gravity is what makes a soccer ball come back down to earth. Even a five year-old can show what gravity means,” she noted. Along with remarks by Yale scientist Dr. Beth Russell, the program featured a visual presentation from scientist Dr. Larry DeLucas. Students sat in rapt attention as the biochemist showed videos and photos from his NASA spaceflight orbiting the earth. “Things like this program can give kids that passion at an early age,” noted the NASA scientist. 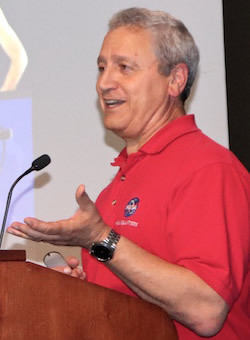 Dr. Larry DeLucas, biochemist and civilian astronaut. Larry DeLucas hung up his athletic shoes after high school and went on to earn five college degrees. His Ph.D. in biochemistry led him into the field of X-Ray crystallography, specifically studying the structure of proteins in the human body. DeLucas flew aboard the Space Shuttle Columbia in summer 1992. The data received from that two-week mission have resulted in pharmaceutical drugs being developed with less cost and greater efficiency. The experience also gave him a new way to engage students. Aram Sarafian and his family stayed long after the program’s end to meet DeLucas. A Massachusetts native, he noted how he and his sons’ bonding over football inspired contest entries from Suren and his younger brother Daron. The boys’ grandfather Garo Armenian sat on the front row as his grandson received an award. His family had emigrated to the U.S. to escape the horrific Armenian genocide, when more than a million people were exterminated in Turkey in the early 20th century. Having lost dozens of loved ones, the elderly patriarch said it gives him perspective on what matters. “Later on, if kids get into trouble and don’t know their way, having faith and values is as important as any academic education they receive,” he concludes. “If you can get a child excited about learning, there is no limit to what they can accomplish,” says Pari. The future looks bright for the SMASH Contest, states executive director Brig Pari. Community leaders in Arlington hope this program leads to kids earning scholarships and, ultimately, a better future. “If you can get a child excited about learning, there is no limit to what they can accomplish,” says Pari. Learn more about the SMASH STEM Foundation and its growing annual competition.